Heidi lines her kitchen table with a virtual pharmacy of prescription pill bottles; celexa for sadness, ritalin for restlessness, ativan for anxiety, depakote for dark downs and hysterical highs, unisom for insomnia. Each bottle tells a tale in Heidi’s life. As an infant, Heidi was adopted by prestigious Southern Californians: a psychologist and his wife. She knows just two things about her origins: 1) her birth mother was very young when she had her, and 2) there was a history of diabetes in her family. That’s it – nothing more. No explanation for why exactly she was given up, who her father was, or if she had any more biological siblings. Very little information; lots of gaps and holes. What she did have was a privileged upbringing- an estate with a view, the best schools, horse riding lessons, and…she was daddy’s girl. Her father worked long hours counseling clients out of a home office but always made time for special little rituals with Heidi. In the mornings they squeezed fresh orange juice together, sitting down at the table afterward with their matching glasses. Afternoons they walked the same path of their property together until it seemed that their footprints were a part of the landscape. At night he kissed her on the forehead and called her “butterfly”. Heidi’s mother was more distant. Hugs were rare and felt forced. Approval was hard to come by. Warmth seemed reserved for her brother Ronnie, who came by way of another adoption when Heidi was three. Sadness. The feeling of being unwanted: before her birth and also after. So yes, Heidi was provided with opportunity. She attended the best private schools in Santa Cruz, with children of the other local elite. They had the freshest textbooks, the most ideal student-to-teacher ratios, artists in residence, and unique, challenging, courses. Where the majority of her peers seized these opportunities and excelled – whether out of self-determination or pressure from parents – Heidi failed and fidgeted. “Sitting in a classroom was the hardest thing. Fifty minutes seemed like waaaay too long for anyone to sit in the same chair”. Heidi’s classroom routine was: bounce knees nervously till someone asks, “where’s the earthquake?”, drift off in space, doodle caricatures of her classmates, tap pen nervously and to the annoyance of others. Eventually she just stopped showing up to classes at all. “I skipped out with this angsty little group of rich kids, doing what kids do when they skip classes. We smoked pot, we drank in our parents dens, we stole stuff we had more than enough money for”. “The way I looked drove my father crazy. I think that was even harder for him than the trouble I got into. Like the trouble he could break down and rationalize as a psychologist. But the dad in him couldn’t deal with what was right in front of his face”. Their very last argument was, in fact, about eyeliner. It was a loud and heated one with a lot of mean words. It built slowly but ended abruptly, with Heidi slamming the door and driving away. When she came back it was bedtime but no one was at home. There was only a note on the kitchen counter. She can’t remember exactly what it said, but what the words amounted to was: her father was dead. What followed? “Guilt- for years. Obviously. I mean I’d give anything for a better goodbye. Or wonder if he’d still be here if I had said goodbye.” Heidi wrestled with those- and other questions- until something came along to help in letting go of them: motherhood. “I realize as a parent that no matter how ugly things get, you love your kids and they love you back. There’s just no doubt”. All grown-up and pulled together, Heidi is now a hardworking mother of two. Mornings are for packing lunches, braiding hair, walking both children to their classroom doors. Afternoons are for swimming lessons, Little Kickers classes, and playing at home. Four days a week, Heidi works the swing shift at a psychiatric residential treatment center for youth. Heidi has a close network of friends and they are always telling her that the only thing wrong with her is hypochondria. “They don’t say it meanly- they’re just honest, and they know better than to feed my paranoia”. But in the fall of 2009, things really were starting to go wrong in her body. “Working in residential, there are a lot of germs floating around. That fall and winter, I had strep throat three times and bronchitis twice. I was almost constantly on antibiotics. After that I started having a lot of stomach problems. I would bloat to where it felt like I was pregnant, and always felt tired or nauseous. My doctor ran all kinds of tests, looking for ovarian cysts and ulcers.” Looking for an ulcer meant subjecting herself to a stomach scope- the fifteen minute swallowing of a long tube with a miniaturized color TV camera at the end of it, allowing for close examination of the esophagus, stomach, and duodenum. The result: no ulcer. More tests and x-rays did reveal something unrelated to Heidi’s digestive troubles. She was found to have a benign tumor on her liver. With surgery invasive, and the small tumor posing no imminent threat, her doctor advised a “wait and watch” approach. He also prescribed one Zoloft for depression. Through all those appointments, her doctor had picked up on a certain level of sadness that was leading to a lack of sleep and motivation, and a whole lot of hopelessness. “I went crazy with the first pill I took…literally. I could go days without sleeping, I was paranoid out of my mind. I’d always been anxious and nervous around people but now I couldn’t even leave my house”. She discreetly met with Human Resources at work. With her job protected through the Oregon Family Leave Act, she hunkered down at home for a six- week leave of absence. “Those six weeks were a major roller coaster. Some days I was exhausted, laying in bed, crying over nothing. Other days I was filled with crazy energy – dancing around the house with my kids, talking hysterically and rapid fire, practically climbing the walls. Every night my mind was racing. I could NOT sleep…no matter HOW tired I was”. Over the course of those weeks she was slowly weaned off of the Zoloft and popping Unisom to get some ZZZ’s. Studies show a close link between celiac disease and mental illness, with three theories in explanation. One idea is that antibodies generated in response to gluten proteins can attack the brain. A second idea is that the gluten proteins themselves, or the peptides generated from them during digestion, are acting directly on the brain. A third idea is that your brain is affected by immune responses in other parts of your body. 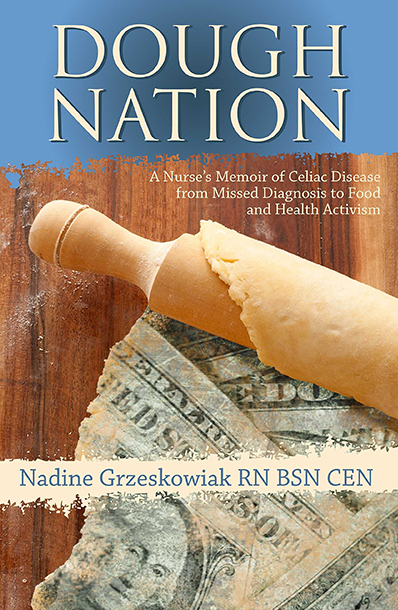 Celiac is an autoimmune disease; all immune activity sends signals to the brain to change behavior and to recruit a range of defensive responses. Taking a look at Heidi’s more recent health history, we pinpoint two things often related to celiac disease and gluten intolerance: 1) the overuse of antibiotics, and 2) unexplained abdominal pain and bloating, most often after the consumption of food containing gluten. “My diet is pretty heavy in gluten, I guess. I eat what my kids eat; lots of pasta, sandwiches, cereal. At night when they’ve gone to bed I like to relax with a beer. I never thought of beer having gluten until my friend pointed that out to me. So, I think the food will be pretty easy to give up, but that nighttime ritual will be hard.” We sit down and make a list of “food alternatives”. Heidi agrees that it should be simple to switch the entire family to a gluten-free diet for the 6 weeks. She’s not at all overwhelmed by the idea of using rice flour bread and quinoa pasta. As for the beer, I show her a list of gluten-free varieties available at local grocery stores, and also present the option of drinking Hard Apple Cider instead. She decides she can do this. At the end of the third week of her gluten-free trial, Heidi is happy to report a lot of positive changes. “I’ve had more energy without a doubt. And have been sleeping better! It’s interesting. Usually when I was falling asleep I’d have this very strange, almost drunken, confused feeling. I’ve noticed in the last couple weeks that’s gone away.” Another thing that’s starting to subside is the stomach pain and bloating. “I do still have troubles on my work days. I’ve been eating at the cafeteria with the kids at work. I’m making sure to just go for the salad bar, skipping the croutons and sesame sticks. But it’s weird-every time I eat there I feel awful afterward”. We talk about the reality of cross-contamination. That can be a hard one for people to buy into; tiny traces of gluten can spread through the shared use of cutting boards, utensils, serving trays, and cooking surfaces. All it takes is one sesame size kernel of gluten to disrupt the system. This is of great concern, especially in a residential setting such as the one where Heidi works. “When we take a group of clients to the cafeteria, we mark attendance in a binder. The first page lists which kids have food allergies, and that’s something we’re supposed to keep an eye on. A lot of those kids are diagnosed with gluten and wheat allergies or full-on celiac disease! I know if I’m not getting a good experience when I’m being so careful about it, they aren’t either”. We talk about discrepancies in care. A client with an allergy to bee stings will never set foot outdoors without an EpiPen in the hand of a staff. Those with latex allergy will never come near it. There is some progress in the recognition of food allergies, but this is mainly relegated to peanuts. Client care is a larger issue than Heidi and I can tackle. We can only take care of her. She makes the decision to bring her own packaged meals to the cafeteria, utensils and all. Heidi has made it through six weeks of eating gluten-free amidst the challenge of balancing work, motherhood, and her own emotions. “Bringing meals to work was definitely the right choice. I feel much more comfortable with my stomach. Less self-conscious”. As for drinking, she says this has actually decreased with the switch to gluten-free beer. “I don’t know what it is, but I’m good at just one beer when it’s gluten-free. Maybe part of it is sleeping better? I don’t know. But before I would average two or sometimes three drinks in a night. Now it’s just one, or sometimes none”. Heidi is also greatly relieved to have lost about five pounds in the last six weeks. Weight gain is one of the more common side effects of Depakote, and while the medication may have leveled her moods out a bit, she was not exactly pleased with going up a pant size or two. On a less superficial note, Heidi has been able to decrease her daily use of Ativan. “Before the gluten-free trial I was taking Ativan up to five times a day. Pretty much first thing in the morning I would need it, then several times in the afternoon, and then definitely before bed. I wasn’t really even paying attention to it at first, but all of a sudden I realized I was taking less. Mostly only on really stressful workdays and sometimes still at night.” She is enthused at the prospect of decreasing or discontinuing other medications; after her traumatic experience with Zoloft, she knows to work closely with her doctor before making any changes.